Hi today am going to introduce u to my new build called incinerate. 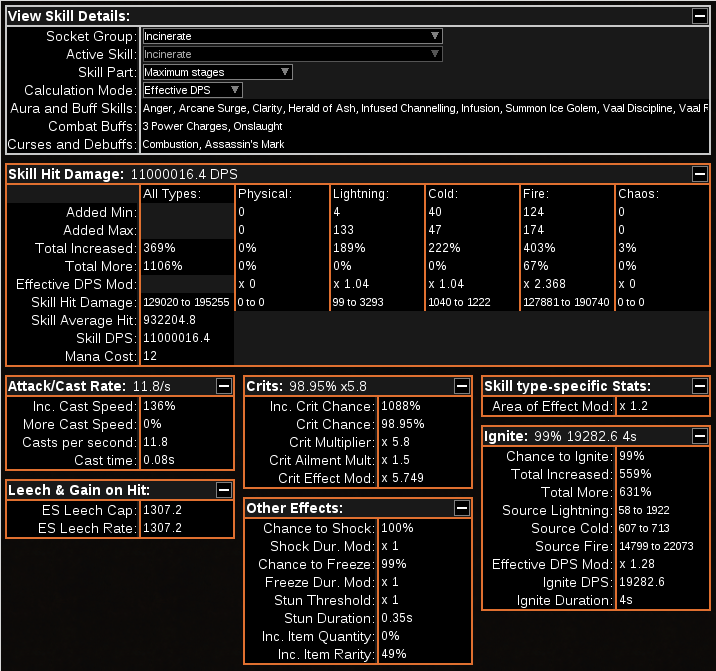 I know there are variety of build that offer 5-6M dps out there. Now what makes my build different is due our mass amount of damage of course and survival as well. Even thought we are dealing 11M+ total dps on the Shaper or 16M+ on the mob, we are still able to leech fine and survive a couple of hits due to our 12k ES. 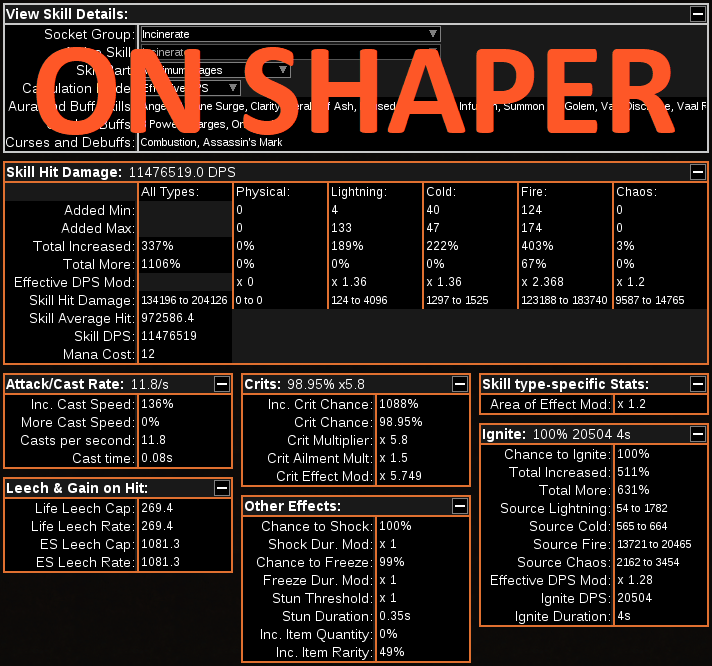 The build utilize shav armor for more aura to support our main spell and mana regeneration. Multiplier from critical strike can be stacked as high as u want them to be. But in order to grasp all the benefit, u need to make sure that ur critical hit is somewhere above 90% chance to critical strike. The new Zealoth Aura also gives a small percentage of more spell damage at the cost of 50% mana reservation. More spell on low life. This one can be obtained via 2 method which is Shavronne's body armor or coward's legacy belt. Elemental penetration will lower the target elemental max resistant, which by default is at 75%. This will cost em to take more damage in return. Vaal gem that am using are Righteous Fire. By activating the gem, it gave the player a boost in spell damage for a short amount of time. Non chaos damage as chaos damage can be found inside assassin's tree node or crafted weapon. I will release my tree once am done with the preparation. 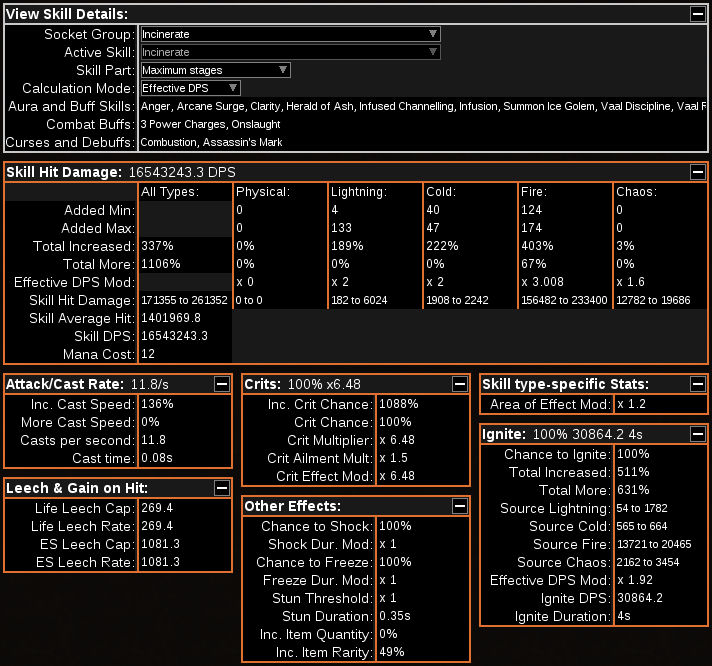 Hi today am going to introduce u to my new build so called flame burst or more known as incinerate. Unlike winter orb, this spell skill requires u to stand still in order to cast and gain stages. As u gain more stages, your damage are multiplying more and more until u release them for 500% MORE damage on top of it. What makes my build different is due to survival. Even thought am dealing 11M+ total dps on the Shaper or 15M+ on the monster, am still able to leech fine and survive a couple of hits due to my 12k ES. The build utilize shav armor for more aura to support our main spell and mana regeneration. PoB link by any chance? I think you should mention this build is for standard. Anything is ultimate and reaches this DPS with 200ex to spare. I know a few of my items are legacy, but the different ain't that huge. Let's look at a bright side. My gear are not even 30% quality or have any quality mod on them. The good news is now GGG already state that the new synthesis league craft mod can now be used together with other previous league craft method. Imagine of u having so many crazy es mod(syntesis league) + so many es quality (betrayal league) + with sooo many fossil crafts (delve league), the possibilities of u crafting gear are way better than what am currently using right now. WOW! IF ur lucky, u may able to add bleed immune or even permanent onslaught on gear..